↑ O'Connor, John J.; Robertson, Edmund F., "Johann Bernoulli", MacTutor History of Mathematics archive, University of St Andrews . ↑ Jacob (Jacques) Bernoulli, The MacTutor History of Mathematics archive, School of Mathematics and Statistics, University of St Andrews, UK. O'Connor, John J.; Robertson, Edmund F., "Jacob Bernoulli", MacTutor History of Mathematics archive, University of St Andrews . 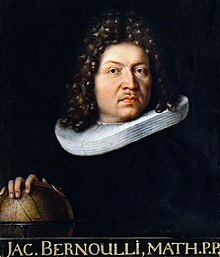 Weisstein, Eric W. Bernoulli, Jakob (1654–1705) from ScienceWorld. Gottfried Leibniz and Jakob Bernoulli Correspondence Regarding the Art of Conjecturing"